How are you measuring the success of your blog? What are the blog metrics that matter? These are more nuanced metrics than overall traffic and traffic over time. The first three metrics above are important to know how well your content is doing on the internet. They all affect the fourth metric, search engine rank. These metrics are part of how Google knows how high to rank you when people do their searches. If these metrics aren’t stellar, you have a lower chance of actually getting to that #1 position and staying there! 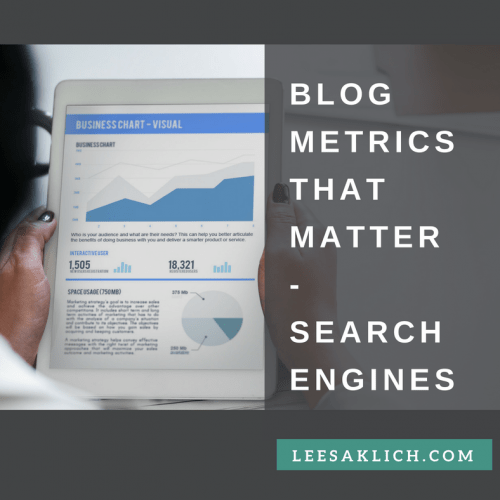 Don’t get me wrong – these are not the only metrics search engines use, they are a few of the key metrics that matter to you as an online health & wellness pro with a blog. Ideally, you can look at and record these metrics on a weekly basis. Monthly is OK if you’re starting out. When you go to your Google Analytics account, make sure you set the timeframe you want metrics on by choosing your dates in the top right-hand corner. 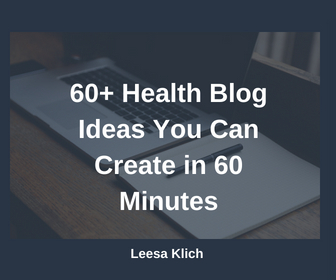 Click here to make a copy of Leesa’s Content Strategy Editorial Calendar. If you need help planning out blog post topics and CTAs that’s included in a tab in this spreadsheet and I made a video for you too. A “unique visitor”, or “user”, is one person (i.e. IP address) that hits your site. As you know, that one person may come back later for another session. Same user, new session. This means your number of sessions will always be larger than the number of users. We’ll dive into how they found you in the acquisition section. Google Analytics measures both users and sessions when you go to Audience/Overview. The two main things that entice people to click on your blog post, i.e. become a “user” and have a “session” are your headline and your image. People can see promotions of your blog posts from lots of places, but they don’t always click the link to go and read them. It’s really your awesome headline and image that entices them to click and have a session as a user. “The real measure of the quality of your content is how long people actually stay on the site. How many pages are people looking at when they have a session on your site? How long do they stay (session duration)? Do they click another page/post before leaving (i.e. not bouncing)? Is your site easy to navigate – does it have a clear UX (user experience)? In your Google Analytics account go to Audience/Overview to see these numbers. Needless to say, more pages/session, a duration of at least 2:00 minutes, and a smaller bounce rate (less than 60%) are what you’re going for. Make sure your headline delivers! If you have a sensational bat-crazy headline and your post is booooring or unrelated, people will bounce quickly! Also, make sure your content is high quality and easy to read – use subheads, images, and short sentences and paragraphs. Put links to other related blog posts throughout your post, and at the bottom, recommend other posts to read. If you add external links (i.e. to other websites, not your own) you should always make sure they open into a new tab. This means when they close that tab with the other website, yours is right there for them to catch up from where they left off. Also, make sure your website is fast and easy to navigate. PRO TIP: If these numbers aren’t awesome, check if there is a difference between the desktop and mobile versions. How are people finding your site? Are they getting to it from a Google search, or did they type your address in the bar or have it bookmarked? Did they click a link on social media or another site? Direct = Typed the address into the bar or had it bookmarked. Social = Through a post on social media. Referral = A link from another site. When it comes to direct traffic, this measures how many people you’ve already built your “know, like, and trust” factor with, who pop over to your website because they already expect great content, even if your headline and image isn’t brilliant. There really is no right/wrong here. Ideally, you want a good mix of ways people find your website. The concern here is if just one or two of these sources dominates this can be a problem if something goes wrong with that channel. In other words, don’t put all of your blog traffic eggs in one acquisition basket. If you are focusing on driving traffic to your site from one of these areas, then keep an eye on that particular metric. So, if you want more organic search, you should focus on SEO (see the next section below). If you want more social traffic, you need to make your posts more shareable, get more active on social media, and/or pay for advertising. If you want more referrals, then you may need to reach out to other blogs to request backlinks (but do it the right way, please!). Well, this is where SEO (search engine optimization) comes in. And there is way more to it than just keyword research. Google has over 200 metrics they measure to decide which page or post to display for each keyword. If you are targetting keywords, you might need some software to help you reach it. To help me optimize my posts, I personally use webtexttool and the Yoast WP plugin. In addition to optimizing your latest blog post for a keyword, you also need to optimize your whole site as well. This means it should be secure (https not http), fast, mobile-friendly, etc. They say what you put your attention on grows, right? So, paying attention to the metrics that matter will help you to grow your blog and really use it to better get more readers, get your readers to become subscribers, and subscribers to become clients! This is part 3 of the series Blog Metrics that Matter series! And don’t forget to download your copy of my Content Strategy Editorial Calendar spreadsheet to start tracking your metrics this week! Which metrics matter the most to you? Which ones do you already track? Which ones will you start tracking? Have I missed any critical ones?